Kenneth Fried in Sderot at the dedication of a youth recreational center. Dr. Kenneth Fried loves baseball. He also loves Israel. Working with the Jewish National Fund, the Demarest resident – and chair of “Field of Dreams,” JNF’s “hardball mission to the Holy Land” – has found a way to combine those two interests. 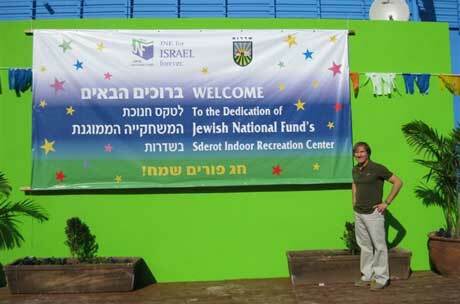 Several years ago, Fried and his wife Sharon, both physicians, were approached by JNF to help establish a secure indoor recreational center for the youth population of Sderot. The couple seemed a likely choice, having provided outdoor recreation equipment to the Solomon Schechter Day School in New Milford, where the bases are dedicated to their four daughters. “I was enamored of the experience,” Fried said of his involvement in the Sderot project. He was also impressed by the JNF projects he saw in Israel. Now, his enthusiasm is directed toward another project. Approached once again by JNF – where he has been named to the group’s North Jersey board – he said “a light bulb went off” when he realized that the competitive men’s baseball games he’s been participating in here could also be played in Israel. Members play both in North Jersey and in Florida. One of his team members is Fair Lawn resident Ritchard Rosen, who will be participating in the Israel trip. Fried thought, “Why not do this in Israel as well?” he said. The plan came together when he was on a bus, speaking with Russell Robinson, the chief executive officer of JNF. The two were talking about the Israel Baseball League, launched several years with great fanfare but little success. Fried believes strongly in the power of baseball. The plan, he said, is to bring a group of baseball lovers to Israel and “to start with the youth, running clinics in addition to participating in games against Israeli teams.” The Israel Association of Baseball, he said, has four teams in four cities. He called it shortsighted to assume that “if you build it, they will come,” unless the groundwork has been properly laid and baseball is partnered with a youth program. While JNF’s “e-mail blast” has generated tremendous interest, he said, the trip, originally slated for May 8-15, will need to be rescheduled, since many respondents have said they need more time to prepare. In addition, to keep costs affordable for the different constituencies who might attend, JNF has agreed to make side trips optional to participants who are coming mainly to play baseball. He also received a note from a man on Kibbutz Lotan in southern Israel who would like to introduce baseball to the kibbutz and needs equipment – and another from a graduate student at the Jewish Theological Seminary who wants to play baseball and explore how Israeli society accepts the sport. For more information about the upcoming mission, e-mail kennyfss@aol.com or ttzour@jnf.org.